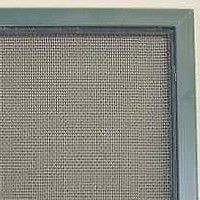 Metal screen in metal (aluminum) frame. Replacing a screen in your window or screen door is a common summertime repair. It's not very hard if you know the tricks. And that's what we'll show you. This tutorial walks you through the steps involved in replacing a damaged screen in an aluminum frame as opposed to a wood frame. First, you need to prepare the frame to receive the new screening material. This will involve cleaning and checking the frame. Using a small screwdriver (or a nail), pry up and remove the old spline from the frame. If it is in good shape (not brittle, dried out or broken), it may be carefully reused. If the spline needs replacement use new vinyl spline material being sure to purchase the proper width for use with the frame. Remove the old screen material. Use a carpenter's square to check and make sure the frame is square (corners at right angles) and straight. Once the frame is prepped, the next step is to ready the screening material. Clamp the frame to a solid flat surface. Cut the screen just shy of the size of the outside of the frame all the way around. Align the screen grid to the frame to make sure the screen grids line up straight with the frame. Using the convex wheel of the screen installation tool, press the screen material into the top and one of the sides of the frame channels. Use short strokes for best results. The intent here is to form the metal screen into the frame channels to get it ready for the spline material. Once the screen is pressed into the frame channels, install the vinyl spline. Using the concave wheel of the installation tool, seat the vinyl spline into the channel by starting in a corner. As before, use short strokes going in the same direction. Try not to go back and forth. Use a screwdriver to press the spline into the corners as necessary. As you press the spline into the frame, it will make the screen taught. Once installed, trim the excess screen material with scissors or a utility knife.